The Phillies Nation Top 100 continues today with #35. Our mission is to assess the Top 100 Phillies players of all time using impact to the Phillies, individual achievement, team achievement, traditional stats, and analytics as our criteria. The list was compiled by Ian Riccaboni and Pat Gallen with input from the rest of the Phillies Nation staff. Please check back tomorrow morning for #34. The Flyin’ Hawaiian came to the Phillies prior to the 2005 season as part of the Rule 5 draft. Selected from the Dodgers by General Manager Ed Wade, Victorino would not make the Phillies out of camp and would be offered back to Los Angeles. The Dodgers would decline the return of Victorino and the rest is history: Victorino would win International League MVP honors after a birth in the International League All-Star game, being named Phillies minor league player of the year. By September 2005, he would reach the Majors and stay there for good. 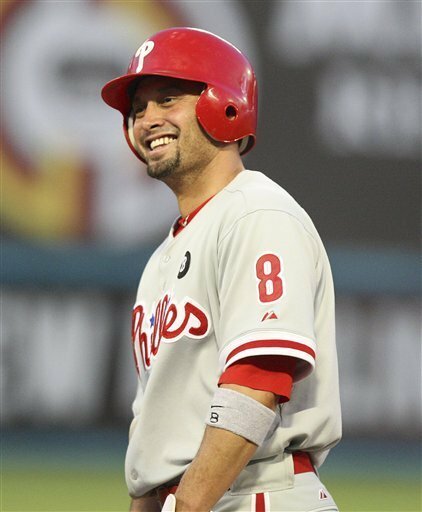 Victorino quickly became a fan favorite for his excellent outfield defense and his tantalizing speed. In 2006, the switch-hitting outfielder would see time across all three outfield positions and move to right field for 2007. In 2008, Victorino would cross the 600 PA threshold for the first time in his career, starting 134 games in center field. Victorino would have a breakout campaign, turning heads with not only his speed but his emerging power: the 5’9″ speedster would hit 30 2B, 8 3B, and 14 HR with a .292/.352/.447 line while also winning his first Gold Glove. Victorino would cement his place in Phillies history in the 2008 postseason, hitting two very memorable homers. The first was a bases-loaded, two-out shot in the second inning of Game 2 of the NLDS off of C.C. Sabathia to give the Phillies a 5-2 that they wouldn’t relinquish. The second, a two-run, one-out shot off of Cory Wade of the Dodgers in the Top of the 8th to knot Game 4 of the NLCS up at 5, setting the stage for Matt Stairs‘ moonshot three batters later. Victorino would win three-straight Gold Gloves from 2008 through 2010, earn All-Star appearances in 2009 and 2011, win the Lou Gehrig Memorial Award in 2008, and the Branch Rickey Award in 2011. For his career, Victorino has an 82.84% stolen base success rate, the 23rd best percentage all-time, ranks second in baseball history in fielding percentage for a center fielder, and fifth in baseball history in fielding percentage among outfielders. Victorino would rank sixth among center fielders in steals from 2005 through 2012, seventh in runs, and 18th in OPS. Among Phillies to primarily play center field, Victorino ranks third in homers, sixth in runs and RBIs, seventh in steals, and tenth in OPS. On July 31, 2012, Victorino’s tenure with the Phillies would come to an end, being dealt to the Los Angeles Dodgers for pitchers Ethan Martin and Josh Lindblom only a few hours before the trade deadline. After the 2012 season, Victorino would sign with the Boston Red Sox, winning a Gold Glove for his work in right field and earning another World Series ring. Phillies in Three-Team Race for Burnett?